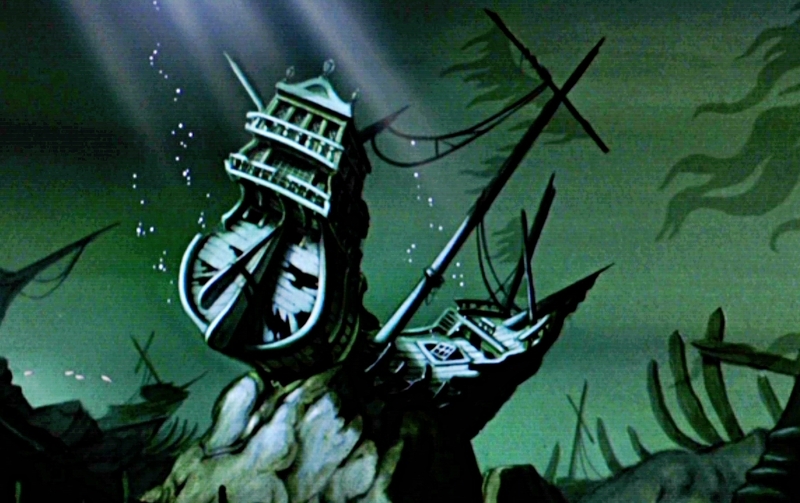 Part of the appeal of conspiracy fables like the Pixar Theory or the Ariel Finds Anna and Elsa’s Dead Parents’ Boat Theory is that filmmakers have been dropping Easter eggs into movies for years now. In Raiders of the Lost Ark, Steven Spielberg inserted hieroglyphics featuring R2-D2 and C-3PO as a shout-out to George Lucas, who’d helped generate the film’s story. The TV-movie that kicked off the rebooted Battlestar Galactica featured a ship designed to look like the one from Firefly, which had its brief run a year before Battlestar began. And of course there are all the Pixar in-jokes, where the studio calls out its own product. But the crucial difference is that those little references are just that: references, winks, nods to viewers and other filmmakers as a way of having a little fun. When characters from A Bug’s Life show up in the blooper reel for Toy Story 2, we’re not meant to infer that these fictional worlds co-exist, just that the filmmakers are having fun with the Pixar library and proving funny little callouts for viewers who are familiar with previous movies. Similarly, we’re not meant to come to the conclusion that the historic cultures that hid the Ark of the Covenant also worshipped a pair of robots, nor that the events of Firefly, which unfold in their own narratively distinct universe, are also somehow meant to play out in the universe of Battlestar Galactica. It’s a goof. We’re not even supposed to see half these things. Before home video and frame-by-frame analysis, these were blink-and-you-miss-it gags. What’s with the current obsession with conspiracy theories, then? Why do some viewers think that some movies have a hidden code that, with just a little effort, can be solved? Part of it is that we, as people, just love conspiracy theories. They’re alluring because they hint at some kind of mind-blowing connection between two things previously assumed to be unconnected, and because they let us feel smart for finding that connection. Conspiracy theories are also notoriously hard to kill, since the absence of proof is given the same weight as its presence. E.g., there’s nothing in Frozen that points to its connection to The Little Mermaid, which is all the more reason for theorists to assume that they actually are connected deep down. Every clue can say what you want it to say, and you never have to be wrong. It’s also because we’re accustomed to viewing movies as branded product, as pure interchangeable artifact, and not just a story played out on the big screen. There’s a certain kind of sense that conspiracy theories pop up in relation to Disney movies: the studio’s princess branding almost encourages the creation of narrative ties between the films. In addition to that, there’s the Marvel cinematic universe, which is constantly expanding with no end currently in sight. Each current Marvel film is designed to function only in relation to the others. They end on cliffhangers and start in medias res because they’re not meant to stand alone. As a result, we’re used to viewing movies not as ends in themselves but as pieces in a larger puzzle. It’s a small jump from tying together multiple cross-film story threads to inventing new ones for ourselves. Yet maybe the biggest influence on these movie conspiracies, though, has been the modern renaissance in serialized TV. The event series of today — the must-watches, the pop hits, the shows so popular you don’t even wait to watch them later on the DVR — have inspired their own cottage industry of recaps and theorizing and speculation. That kind of content jumps gleefully down the rabbit hole every week, positing theories and connections that don’t have to pay off because a new episode will come along shortly and send everyone sniffing in a new direction. For some viewers, modern TV shows — mystery or not, regardless of genre — are meant only to be pulled apart and strained for clues. That hunt for twists and surprises can bleed over into the ways we consume other media, as it has with the conspiracy theories about a pair of totally unrelated Disney movies released 24 years apart. We’ve internalized the episodic growth of TV series and tried to apply it to movies, so we expect each movie to somehow tie to another or exist with it, or inside it, or next to it. But there’s an enormous difference between homages and references on one hand and actual signs of connected narrative worlds on the other. The former happens all the time. The latter, almost never. Films can be many things, and sometimes they’ll even have little jokes or references that remind us we’re viewing a fictional work. But it’s a bad way to live to start thinking that every movie is a puzzle that needs to be solved, and that every film is just a clue to “unlocking” another one. Movies aren’t means to some mystical, conspiracy-laden end. They’re the end in themselves. When we miss that, we miss what makes art so meaningful in the first place.